Notre Dame de Paris was built in 1163-1325, on the site of a previous cathedral from the fourth century dedicated to Saint Etienne. The choir was completed around 1177 and the high altar was consecrated five years later. The transepts and nave were mostly built from around 1196 to 1208 and the west front with towers was completed in the 1250s. During the next twenty years, the transepts were remodelled in a more up-to-date style and the final touches on the whole structure were completed in 1325. Hotel de Sens was originally built for Tristan Salazar, archbishop of Sens, in 1475 to 1507. It is one of the oldest examples of a hotel particulier in Paris, with a main block intersecting between an enclosed courtyard at the front and garden at the back. The entrance arch to the courtyard is flanked by pepperpot turrets and was originally decorated with a display of heraldry and archbishop's emblems, but this was hacked off during the revolution. The arch has an inset shoot at its point to discharge boiling liquids on attackers. Hotel de Cluny was built in 1485-98 to house the abbots of Cluny. The gallery on the lefthand side of the courtyard was added in 1500-10 by Jacques d'Amboise, whose brother was during the same period remodelling Chateau de Gaillon to become the first building in France to feature an Italianate renaissance design. The courtyard is closed off from the street by a crenellated screen but the octagonal staircase, sculpted dormers and cornice of the main block are all visible from the outside. The house was converted to a museum in 1843, which now also includes the remnants of Roman baths, over which the medieval house had been built. The church of St Severin was mostly built between the 13th and 15th centuries. The bells were cast in 1412 and are among the oldest in Paris. The entrance portal was moved from the church of St Pierre-aux-Boeufs on Ile de la Cité in 1839, after St Pierre had been demolished in 1837. Hotel Jean d'Herouet has the only remaining gothic angle turret in Paris. Is is dated to around 1510 and was built for the treasurer of Louis XII, Jean Herouet. The house was almost completely destroyed by a bomb in 1944 but was subsequently rebuilt. The Chateau de Saint-Germain-en-Laye was turned into a renaissance castle under the direction of Pierre Chambiges around 1539. The original castle was built in 1124 but was destroyed in a fire in 1346, leaving only the Sainte Chapelle from 1238. Within 20 years, the castle had been rebuilt by the architect Raymond du Temple. The building as redesigned by Chambiges underwent restoration during the second empire. The church of Saint-Eustache was built in 1532-1632, on the site of a previous chapel from 1223. The architect is unknown but possible suggestions include Jean Delamarre, Pierre Lemercier or Domenico da Cortona. The church is regarded as a blend of gothic and renaissance elements. The Chateau d'Anet was built in 1547-52 to a design by architect Philibert de l'Orme for the mistress of Henry II, Diane Poitiers. Most of the building was demolished after the French revolution but some elements including this frontispiece was salvaged for the Musée de Monuments Francais. Some elements were reinstalled at Anet after World War II as part of a restoration effort, but the frontispiece is still at the courtyard of Ecole des Beaux-Arts in Paris. The courtyard facade of Hotel d'Angoulême Lamoignon was created after 1584, when the property was bought by Diane de France, duchess of Angoulême and daughter of Henri II, but its possible that the design was grafted on to a pre-existing structure. The architect is believed to have been Louis Metezeau, who may have been inspired by Jean Bullant's garden front at Chantilly where the corinthian cornice is also broken by dormers. The use of giant pilasters presumably reflects the royal status of the owner and the pediment statues of stag and huntresses is a reference to her name, as Diana was the Roman goddess of the hunt. A similar facade also existed on the garden front but has since been lost. Place des Vosges, or Place Royale as it was originally known, was built in 1605-12 on the site of the previous royal residence Hotel des Tournelles, which was demolished after Henri II died in a jousting accident on the grounds in 1559. The design of square was originally intended to include houses on three sides and a silk weaving factory to the north. All the houses were to be built according to an identical design, except for the central pavilion on the south, which remained royal property until the revolution. The decision in 1607 to remove the factory and build a fourth row of houses to the north was supposedly because the residents proved to be of higher social rank than was first intended. The Queen's Pavilion was built to maintain symmetry with the original King's Pavilion to the south. The architect is unknown but may have been Clement Metezeau, Jacques Androuet de Cerceau and/or Claude Chastillon. The architecture is often compared with Place Ducale in Charleville-Mezieres or Hopital St Louis. An equestrian bronze statue of Louis XIII was installed in 1639, which was destroyed during the revolution. A new statue in white marble was completed in 1825. The square has been known as Place de Vosges since 1800, in honour of the first department to pay taxes to the state under the French revolution. Place Dauphine is the second of the residential squares that were begun during the reign of Henri IV. The land became available after the completion of Pont Neuf in 1607, which had involved joining the islets at the western tip of Ile de la Cité with the main island. The square consisted of 32 identical houses, of which the two fronting Pont Neuf still remain. The rest have been demolished, replaced or extended. The triangular space was closed on all sides, with only a narrow passage leading to Rue de Harlay, where all the houses were expropriated and made available to the Prefecture of Police in 1856. Arches were built at both ends of the street and over the passage to Place Dauphine. This lasted until 1871-74 when the houses on both sides of the street were cleared for the extension of the Palace of Justice by Joseph-Louis Duc. The Prefecture subsequently moved to a new building on Quai des Orfevres. The rest of Place Dauphine was also intended for demolition. The plan was to replace the square with park to offer better views of the new facade of the Palace of Justice. A fountain by Charles Perrier was installed on Place Dauphine in 1803. It was removed in 1874 and is now in the town of Riom in Auvergne. A third square was also planned during the reign of Henri IV near modern-day Square du Temple, but the project was abandoned after the assassination of the king. Place de France would have been a semi-circular space entered through a new gate in the city walls. Identical houses with corner turrets and octagonal domes would have stood in a ring between radiating streets. The church of St Etienne du Mont was completed in 1626, after a construction period that lasted 134 years. The choir was completed in 1537, the nave around 1587, and the work on the facade was begun in 1610. The new church, originally designed by Etienne Viguier, replaced a previous one from 1222, which had been enlarged in 1328. It previously stood next to the abbey church of Sainte Genevieve, but the latter was demolished in 1807, leaving only the bell tower known as Tour Clovis (right). Sainte Genevieve traces its origins all the way back to 502 but was rebuilt in the 11th and 13th centuries. The complex of school buildings, which replaced the abbey, was built in 1825 and was enlarged in 1866-73 and 1932. Hotel de Sully was built in 1625-30 to a design attributed to Jean Androuet du Cerceau. 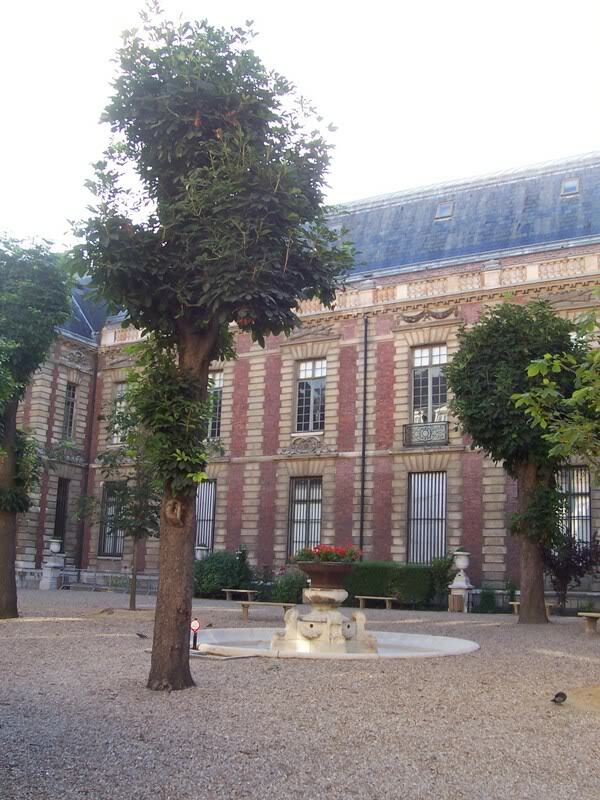 The Duke of Sully bought the house in 1634 and an additional wing was added to the west on the garden side by architect Francois le Vau in 1660. The sculptures on the facade represent the four seasons and the elements. Construction on of the church of St Gervais et St Protais began in 1494 but the design of the facade, by Salomon de Brosse, is dated to 1616 and is considered the first classical church front in Paris. The church is the third to be built on this site. Salomon de Brosse was grandson of the architect Jacques Androuet du Cerceau and his career seems to have started at the now-demolished Chateau de Verneuil-en-Halatte, which was begun by his grandfather in 1550s. He was the architect of the Chateau of Blerancourt and Coulommiers, which have both largely been destroyed, and the Brittany parliament of Rennes. The Luxembourg Palace was built to a design by Salomon de Brosse as the royal residence of the queen regent Marie de Medici. Construction began in 1615 and was completed around 1630, after Martin de la Vallée replaced de Brosse in 1623. Marie de Medici had bought the nearby Hotel de Luxembourg in 1612 for the purpose of building a new royal residence and had sent the architect Louis Metezeau to Florence to study the Pitti Palace where she had grown up. The garden front is actually from the 19th century and was completed by the architect Alphonse de Gisors, who extended the palace by copying the original facade. The sculpture of the central frontispiece is by Jean Jacques Pradier, and was commissioned by King Louis Philippe during the July Monarchy. Due to the extension, the main body of the palace now has six corner pavilions where there were previously only four. The church Saint-Paul-Saint-Louis was built for the Jesuits in 1627-41 by architects Etienne Martellange and Francois Derand. A previous church just around the corner called Saint Paul des Champs was demolished in 1796. Temple du Marais was built to a design by Francois Mansart in 1632, as a convent church for the Order of the Visitation of Holy Mary. The works were carried out by the master mason Michel Villedo. The rest of convent was demolished in the years after the French revolution. 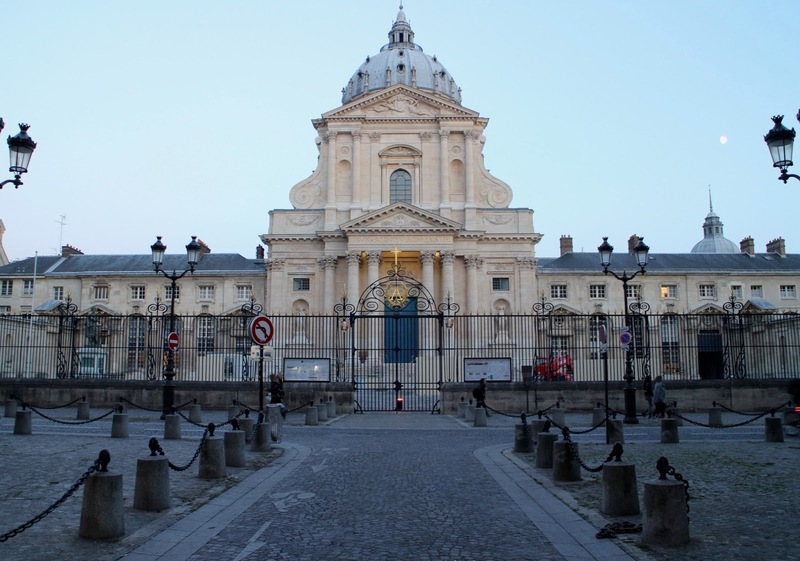 The chapel of Sainte-Ursule de la Sorbonne was built in 1635-42 to a design by Jacques Lemercier for the University of Sorbonne. A previous chapel from 1326 was initially meant to be preserved but was eventually demolished. The college was originally founded by Robert de Sorbon in the 13th century as an institution in support of poor students. Cardinal Richelieu took over as the college principal in 1622 and work began in 1627 to replace the disparate collection of buildings that had developed around the old chapel with a new complex constructed around a chapel. The Galerie Mazarine by architect Francois Mansart was built after cardinal Mazarin bought Hotel Tuboeuf in 1643. The gallery on the ground floor was built to exhibit the cardinal's collection of antiques. the first floors still features a stuccoed ceiling with paintings by Giovanni-Francois Romanelli and Giovanni Grimaldi. 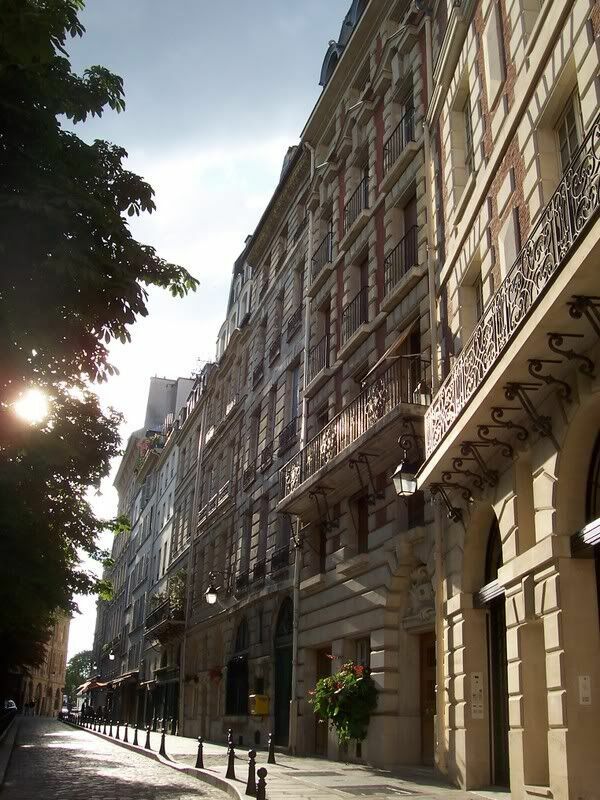 The facade is a continuation of the original hotel (left) which was first begun in 1635 for Charles Duret de Chevry. The complex was later extended from 1646 by Pierre le Muet and again from 1731 by Robert de Cotte. It is later turned into the Bibliotheque Nationale by Henri Labrouste in 1857-67. It was extended again in 1906 to 1932 by Jean-Louis Pascal. The church of Val-de-Grace was built between 1635 and 1667. The original architect was Francois Mansart though he only worked on the project for one year. His successors include Jacques Lemercier, Pierre Le Must and Gabriel Leduc. The church was founded already in 1621 by Anne of Austria, queen consort of Louis XIII, but construction only really got underway once she became queen regent. Institut de France was originally built for the College des Quatre-Nations in 1662-88 to a design by Louis le Vau. The architect was simultaneously working on a new wing for the Louvre and proposed that the new college should be built directly opposite on the south bank. He also wanted a bridge to complete the composition but Pont des Arts was only built in 1802-04 and the present structure is from 1981-84. The site had become available due to the demolition of medieval Tour de Nesle and parts of the city wall and moat. Le Vau died in 1670 and the project was completed by Francois d'Orbay. The royal chapel at the Hotel des Invalides was designed by Jules Hardouin Mansart in 1679-91. 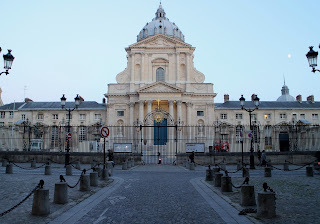 The chapel was an addition to a military hospital begun in 1670 to a design by Liberal Bruant, and Hardouin Mansart had already assisted Bruant in the completion of the veteran's chapel before Louis XIV commissioned the construction of a royal chapel. The design is supposedly based on a project of Francois Mansart for an unexecuted chapel at St Denis. Hotel de Soubise owes its present appearance to the architect Pierre-Alexis Delamair, who remodelled the previous Hotel de Guise in 1704-05. Delamair created a new main facade and added a columned courtyard to the south. The statues representing the four seasons were executed by Robert Le Lorrain. The house was originally built as Hotel de Clisson in 1371 and a fortified front gate with turrets still remain on Rue des Archives. The Duke of Guise took over the building in 1553. Works were carried out during this period, including a chapel by Primaticcio, but only fragments remain. The west front of the church of Saint Sulpice was designed in 1732 by Giovanni Servandoni, who seems to have found inspiration from St Paul's cathedral in London. Servandoni died in 1766 and his design was later modified by Jean Chalgrin who changed the design of the towers. The pediment was also removed after lightening struck in 1770 and was replaced with a balustrade. The mismatch of the towers were due to the French revolution, which interrupted Chalgrin's effort to have them rebuilt to a new design. The church is the second biggest in Paris and was begun in 1646, replacing a previous church from the 13th century. Construction of the Ecole Militaire building began in 1753 to a design by architect Ange-Jacques Gabriel, after an initial project was rejected as too ambitious. The plan was reduced after the expulsion of Jesuits in 1764, when the Jesuit college was chosen as the site for a rival institution. The school was created as an academic college for cadet officers. The west front of Saint Eustache was added in 1754 to a design by architect Jean Hardouin-Mansart de Jouy. The towers were originally supposed to be taller and changes in design also includes the central pediment. These cost-saving measures were apparently insufficient and the southern tower was never completed. The towers on the original front were also never completed, the decision to remove it was taken after it became destabilised by the addition of two new chapels in 1665. A design for a new facade by Louis le Vau was never carried out. Hotel de la Marine was buit in 1757-74 as one of two twin buildings on Place Louis XV by the architect Ange-Jacques Gabriel, who also designed the square. The decoration in the pediments represent magnificence and felicity and is the work of sculptor Guillaume Coustou and Michel-Ange Slotdtz. It originally housed the royal wardrobe (Garde-Meuble de la Couronne) but became the naval ministry in 1789. Construction of the Pantheon in Paris was begun in 1758 and was completed ten years after the death of its architect, Jacques Soufflot, in 1790. The building was originally intended to replace the old abbey church of Sainte Genevieve, which was later demolished in 1802-07, but was given a secular function after the revolution. The east-end bell towers were demolished as part of this transition and the aisle windows were blocked off. The design is partly based on architectural ideas championed by Abbé Laugier, which sought to remove superficial decoration like pilasters and to emphasise the structural nature of free-standing columns, though it has also been seen as fusion between Greek and Gothic design principles. Soufflot designed the semicircular space in front on the entrance portico, with two identical buildings on either side Rue Soufflot, though only one was completed in his lifetime, the second was built in 1844-50. The creation of Rue Soufflot, which had also been part of the plan, was realised in the early 19th century. A devastating fire in 1776 provided the opportunity to modernise the east front of the former Palais de la Cité. The palace had ceased to function as royal residence since the late middle ages but functioned as the seat of parliament and held several administrative offices. The Grosse Tour was demolished in in 1778, demolition of the eastern wall began in 1781 and was followed by the Tresor de Chartes in 1783. The main entrance fronting Cour de Mai was built in 1785-87 by architects Pierre Desmaisons and Jacques-Denis Antoine. The Sainte-Chapelle, built in 1242-48, was preserved. The Arc de Triomphe was completed in 1836 but was originally commissioned thirty years earlier. A design by Jean Chalgrin was chosen to commemorate the victories of the Napoleonic armies and a replica in wood was erected in 1810. Chalgrin died in 1811 and the project was halted after Napoleon's defeat in 1814. Work resumed ten years later and was continued by Jean-Nicolas Huyot and later by Guillaume Blouet. The Arch of Titus in Rome is usually quoted as the main source of inspiration for Chalgrin's design. Plans to replace the 12th century church of Mary Madeleine, which had originally been a synagogue, had been presented in the 1750s as part of the overall scheme for Place Louis XV (Place de la Concorde). Construction began to a design by Pierre Contant d'ivry in 1763 but was stopped after a year. Work continued to a new design by Guillaume-Martin Couture but again came to a halt with the revolution. Progress resumed in 1806 when Napoleon decided that the new building was to be used as a monument to the French army. A competition was won by Claude Etienne de Beaumont but Napoleon overruled this by choosing a design by Pierre Alexandre Vignon, which reused the front portico by Couture to create a Greek style temple. The building was finally completed in 1842, by which the time the decision had been made to consecrate it as a church. The neo-classical courtyard facade of Palais-Bourbon was added during a reconstruction of the assembly chamber, which took place between 1829 to 1843, by architect Jules de Joly. The wings of the courtyard and the entrance portico that faces Place du Palais-Bourbon is from the period leading up to the revolution, when the original palace from 1726 to 1730 was being extended. The palace first became a parliamentary building in 1795 and the portico that faces Place de la Concorde from across the river was designed in 1806 by Bernard Poyet. The original building was a pavilion-like structure reminiscent of the Grand Trianon at Versailles. broke out in 1789. The church was completed in 1823-24 by architect Jean Aime Moutier and was restored in 1848-54 by Joseph Nicolle. The previous church was built in 1683 by Jules Hardouin-Mansart and had replaced an older church from the 14th century. Theatre du Rond-Point was built in 1858 by architect Gabriel Davioud, who also built the two theatres on Place du Chatelet. The original function of the building was as a display of a panorama. This was a popular visual spectacle of the time and consisted of a large panoramic painting, which covered the interior walls of a circular building. This was done to give the viewer the illusion of being present in a foreign land or historic event. It was converted into a ice skating rink in 1893-1964 before it was finally turned into a theatre. Sainte Genevieve library was built in 1838-50 to a design by architect Henri Labrouste and is particularly know for its glass and iron reading room. The library inherited the collection of the abbey of Sainte Genevieve, which had became one of the largest monastic libraries in the country by the 13th century. The collection had been dispersed in the 17th century but efforts had been made to buy its contents back. The basilica of Sainte-Clotilde was built in 1846-57 to a design by German-born architect Franz Christian Gau, who had previously directed the restoration of medieval Parisian churches such as Julien-le-Pauvre and Saint Severin. Gau died in 1853 and the project was completed by Theodore Ballu. It was the first neo-gothic project in Paris and draws inspiration primarily from 14th-century gothic. The belfry of the church of St Germain de l'Auxerrois was built in 1858-62 to a design by the architect Theodore Ballu. It was built at roughly the same time as the mairie of the first arrondissement by Jacques Hittorff, which appears as a twin building to the church. The latter has a gothic porch from 1435-39 by Jean Gaussel. A rood screen by Pierre Lescot from the 16th century was destroyed in 1745 but some of the relief work by Jean Goujon has been preserved and is on display in the Louvre. 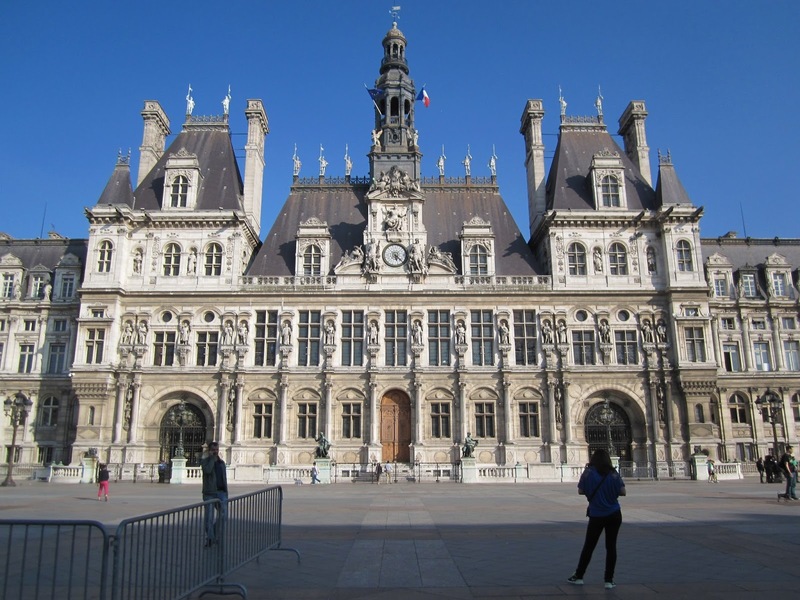 The Paris City Hall, Hotel de Ville, was originally built in 1533-1623 to a design by the architect Domenico da Cortona, nicknamed Boccador. Additional wings to both sides of the original structure were added in 1837-48 by architects Etienne-Hippolyte Godde and Jean-Baptiste Lesueur. The building was destroyed in a fire in 1871 and the initial hope of reusing some of the external walls were soon abandoned. It was therefore an entirely new structure, built to the same design as the predecessor but on a grander scale, which was built in 1874-82 by architects Theodore Ballu and Edouard Deperthes. The Gare d'Orsay was completed in 1900 as the Paris terminus for travel to and from southwestern France. The train station, which also included a hotel, was designed by architect Victor Laloux. The cast iron and glass train shed is hidden from external view, presumably due to the close proximity to the Louvre which may have dictated a more traditional treatment of the facade. The train station closed in 1969 and the hotel followed four years later. The decision to convert the building into a museum was taken in 1977 and Musée d'Orsay was first opened in 1986. The train station replaced a government building (Palais d'Orsay) from 1810-38 by architect Jacques-Charles Bonnard, which was burned to the ground in 1871. The Grand Palais was built in 1897-1900 for the Exposition Universelle to a joint design by four architects: Henri Deglane, Albert Louvet, Albert Thomas and Charles Girault. A previous exhibition hall named Palais de l'Industrie was demolished to make way for the new project. This had been built for the Paris World Fair in 1855 to a design by Jean Marie Victor Viel and engineer Alexis Barrault. Like Grand Palais, the previous building also included a cast iron and plate-glass structure, inspired by the Crystal Palace. The site had been used to build temporary structures for the exhibitions of 1839, 1844 and 1849. The Petit Palais was built for the 1900 Exposition Universelle to a design by Charles Girault. It now houses the City of Paris Museum of Fine Arts. Girault designed a similar building for the 1910 Exposition Universelle in Brussels, which opened as the Museum of the Belgian Congo. 29 Avenue Rapp was completed in 1901 to a design by architect Jules Lavirotte. The work was commissioned by the ceramist Alexandre Bigot who created some of the ceramic details himself. It is one of the nine art nouveau buildings Lavirotte designed in the 7th arrondissement. The entrance portal was designed by Jean-Baptiste Larrivé and was sculpted by Theobald-Joseph Sporrer, Firmin-Marcelin Michelet and Alfred Jean Halou. These two mansion blocks on the northwest corner of Square du Temple were completed in 1907-08. 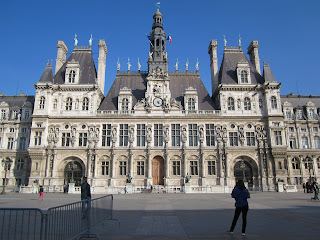 The turreted building on the right was designed by architects Raymond Barbaud and Edouard Bouhain and includes a sundial and sculpture in relief by Jules-Louis Rispal. 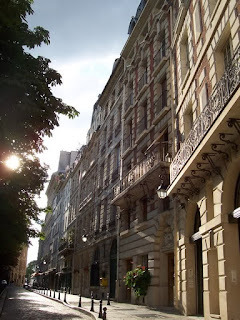 Boulevard Raspail, originally known as Boulevard d'Enfer, was created in a piecemeal fashion beginning in 1866 but was only inaugurated in full in 1913. A square was created at its intersection with Rue de Sevres in 1870 and named after the founder of the Bon Marché department store. Bon Marché was founded in 1852 and is considered the first modern department store and was also the company that commissioned Hotel Lutetia, an art nouveau building from 1910 by architect Louis-Charles Boileau and Henri Tauzin. The building shown in the image stands opposite the hotel and was completed in 1912 by the architect Louis Sorel. The last stretch of Boulevard Raspail, between rue du Bac and rue de Sevres, was completed in 1904-07. This building is dated to 1909, by architect Eugene Chastel. It is situated on a narrow plot between an early modern building from 1925 by architect Hippolyte Abraham and a house that I couldn't find date or architect for but where journalist and politician Marc Sagnier (1873-1950) apparently lived. The building of the Louis Vuitton Foundation was built in 2007-14 to a design by Frank Gehry. The project was initiated in 2001 and the building plans were first presented in 2006.